An executive chair with lots of adjustment options may be well suited to a specific office and individual tastes. But in a conference room environment, you don't want attendees adjusting chairs to suit their individual preferences, especially during the meeting. Executive chairs in an individuals office are often high-back designs. In this case, the executive chair does not dominate the room. But lots of high-back chairs could easily overwhelm a conference room. Instead, these guidelines apply to choosing conference room chairs. Most conference room chairs should be mid-back or slim design to limit their dominance. Chairs should complement the conference room table style, color and decore. 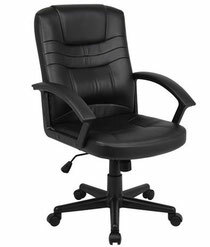 Most executive chairs allow uses to lean or tilt back. A large adjusting knob can be tightened to set the amount of force required for the chair to tilt backward. Most tilt designs pivot the chair around the centerline. As a user leans back, their knees go up. Centerline tilt chair designs are just fine for typical office desks that may be 1 inch thick. There is plenty of room between the top of a users knees and the bottom of the desktop. But the thickness of a quality conference table is between 1 ½ to 2 inches. This added thickness means there is a greater chance user’s knees will be pinched between the front edge of a chair and the underside of the conference room tabletop. This condition is exacerbated for tall users who typically adjust the chair seat to a higher than normal setting. Deluxe knee tilt designs are different. The pivot point is not in the center of the chair but located in the front. The seat is still able to tilt back and minimizes the potential of pinched knees between the front edge of a chair and the under side of the table. Most quality executive chairs come with dual wheel hard plastic casters that are well suited to carpet flooring. But if the flooring is tile or hard wood, plastic casters will not roll properly and may even leave marks on the floor. A better solution is a caster that is specially made for hard floor surfaces. These casters wheels are lined with a hard rubber that will not only roll better but provide greater comfort for the occupant.. Following these simple guidelines reduces the number of available choices from hundreds to a more manageable few. These additional examples provide more guidance. If your conference room table has a thick table surface (3 or more inches) with prominent table supports, the table has a strong and very dominant character. In this case, the chairs can afford to be high-back with heavy padding without overwhelming the table. In fact, a stronger chair presence will complement the dominant character of the table. If the table surface is made of wood (typical for thicker table tops), consider using the same wood as chair trim. If the conference room is large and can support a slightly larger table, consider adding table length but keep the chair count less than the maximum. In this way, the chairs can be spaced farther apart (side-to-side clearance), which will lessen their impact in the room. High-back chairs with thicker padding will not not appear to be as dominating. Conference room tables with laminate surfaces may use chrome legs or trim. Chairs with chrome accents or base trim are a good match for these kinds of tables. If the table does not have chrome trim, a chair with black or gray trim may be a better complement to the table style.